Only one more week of winter! Let’s get the party started! This is all the appetizer you will need to put everyone in a good mood. Kids at the table? No problem, just serve them Virgin Mary Lentil Soup. Tastes fantastic either way. In a large saucepan, heat the olive oil over medium heat. Toss in the onions and garlic and sauté for several minutes, until softened. Add the lentils, celery root, tomato juice, thyme and seasoning. Bring to a simmer then continue cooking for 20-25 minutes, until lentils and celery root are softened. Remove the thyme sprigs. Blend to a smooth consistency adding a little water to get a thick purée. Serve hot and add vodka to adults portions before serving. Garnish with celery sticks and lemon wedges. Serves 8. Check out the Canadian Lentil Recipe Contest. 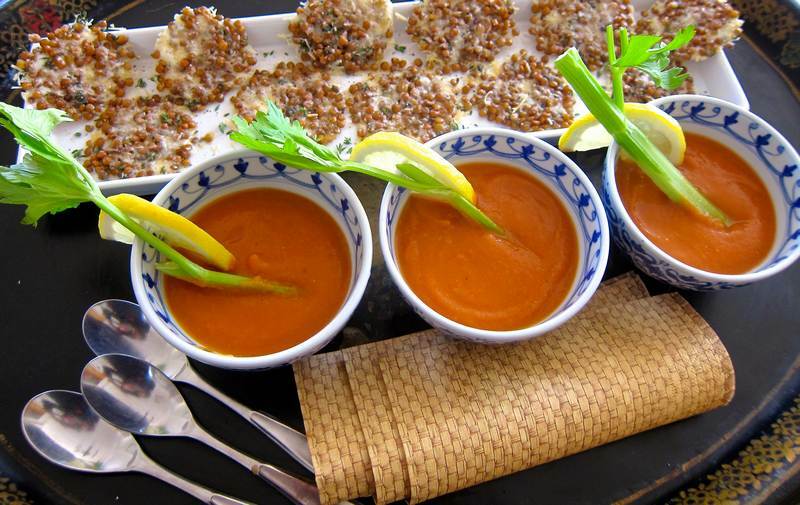 If you are a Jittery Cook fan and you want to help me win this contest, please click on this link to the Canadian Lentil FB page and ‘Like‘ the Bloody Mary Lentil Soup recipe and comment, comment, comment. There’s a huge prize at stake and winning it would go a long way towards convincing my husband that all this Jittery blogging isn’t a waste of time. Thank you, thank you, thank you!!! Already “Liked?” Now you must read these 8 things the world’s most successful people all have in common. And now you must read these 10 things you should do every day to improve your life. How many are you already doing? « Pizza 101 – Impress Yourself! Now that’s something I could wrap my mouth around. Love the lentil! Even better when you liquor it up. Huge snow storm here today. May hit the bottle and worry about the lentils later! Sounds yummy – do you think it would work with Clamato juice? if yes, throw in some worcestershire sauce and you could have a uniquely Canadian version! Excellent idea!!! 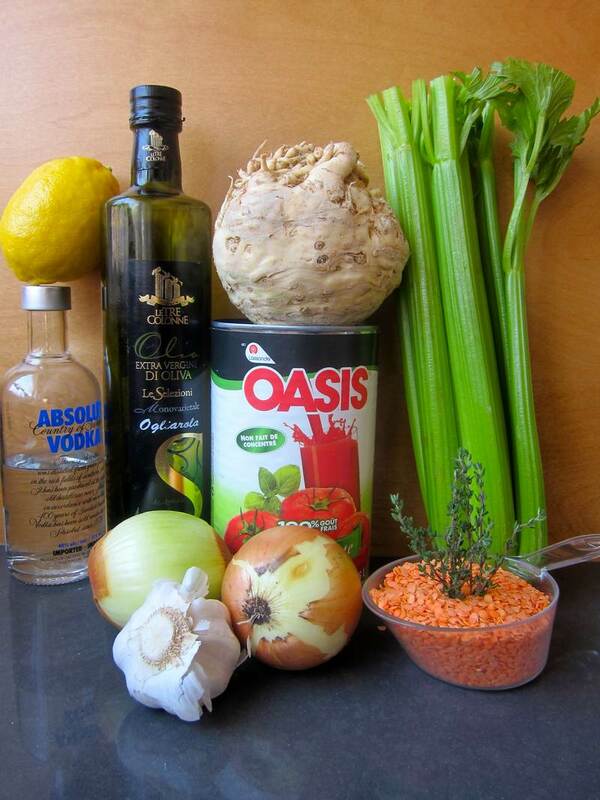 I thought of Bloody Caesar Lentil Soup first, but wanted it to be more versatile for the vegetarian, vegan, kosher set. Now this is a grownup tomato/lentil soup. What a great idea. It is truly a crowd pleaser. Virgin Mary Lentil Soup is excellent too. So easy to prepare and I get a kick out of the vodka part. I’ve always loved a really good Bloody Mary or Bloody Caesar. The celery root seals the deal! !